Hoi An the top tourist designation for any traveller in Vietnam and once you arrive it is easy to understand why. We enjoyed the place so much we extended our stay! Unless you are on a ‘open tour’ getting to Hoi An will involve going via Da Nang. Da Nang is the closest city to Hoi An and has a small international airport and is a popular domestic train stop. 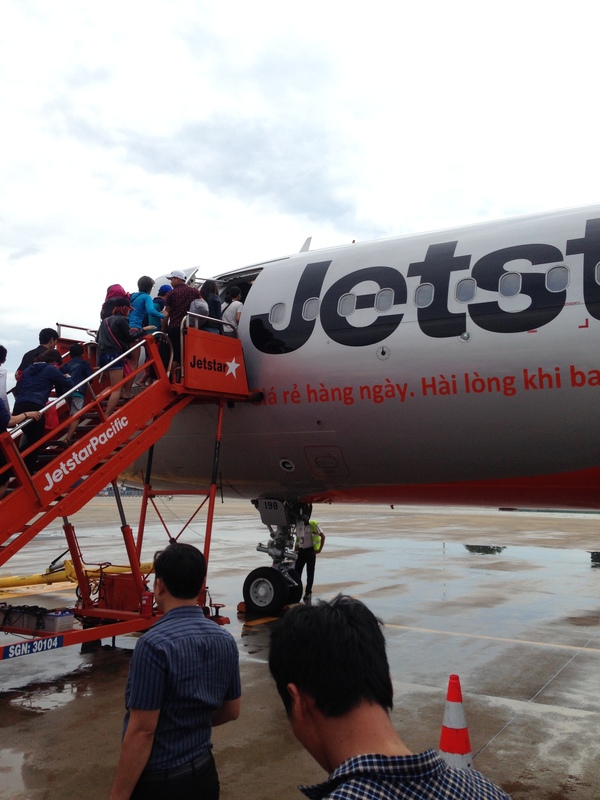 We choice to fly to Da Nang as we were coming from Ho Chi Minh City as we did not fancy a 8-10 hour bus/train ride. The flight took only an hour from HCMC and was about the same price as the train! So pretty cheap! So i’m at Da Nang airport, how do I get to Hoi An? Da Nang is 3okms to Hoi An from the airport and you can either get an expensive taxi from out front of the airport (which is the most obvious choice) or it is possible to catch a local bus. Yes a local bus but it does require a bit of walking but will save you money! The Hoi An bus (route number 1) does not run via the airport however, the nearest bus stop is only about 2km away (see map below). It is an easy walk and fairly straight forward to get from the airport to the bus stop. It is also possible to catch this bus if you arrive by train as the bus stop is very close to the station. Local bus: 20,000 Dong but expect to pay an extra 30,000 Dong for being a tourist/ carrying your bags. Still much cheaper than a taxi and after all the walking several cold beers might be a good use of the saving.. Walking from the airport to the bus stop. Google maps suggest that it takes 25 mins to walk but we managed it in 20 mins. It is flat, with a good sidewalk, just watch out for all parked bikes which litter the sidewalk. The Da Nang to Hoi An bus runs about every 20 minutes for most of the day and takes about 45min. We are not sure how late the bus runs but if we had arrived after 6pm we would have likely taken a taxi. Be ready to start walking again as the local bus station for Hoi An is about a 20-30 min walk to the Old Town. Lucky for us our homestay was about a 10 min walk away but if you don’t fancy walking any further local taxis and motorbikes are waiting to take you. Not sure on the cost but it should be relativity cheap as distances are short. Now that you have managed to save a few Dong it is time to find a place to have well earned cold beer and enjoy the beautiful old town of Hoi An.